Think changing your physiology is impossible? 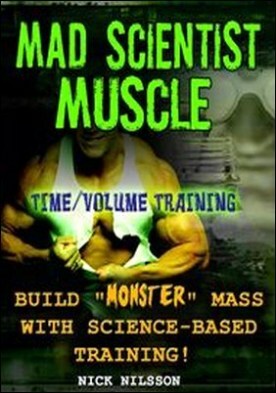 THINK AGAIN…With Mad Scientist Muscle: Time/Volume Training, you’ll use science-based training techniques, like “controlled overtraining” and “structural training”, to optimize your physiology and prepare your body for muscle growth. Time/Volume Training is all about short sets, managed rest and high volume. It’s an ideal way to achieve muscle mass gains even with bodyweight exercises. Best of all, every training session is designed to be completed in less than an hour!Also included:- Detailed nutrition section – Supplement guide – Low-carb dieting option – “Lazy Cook” muscle-building recipesThis book includes the most INSANELY effective training techniques you’ll ever experience. It is packed with powerful training methods designed to build MASSIVE muscle by using a volume/intensity-driven format.